Working women face challenging stressors involving both their family and professional lives, juggling roles as a wife, mother, and earner — managing their careers while maintaining traditional roles. In fact, one study showed that women in the United States and Western Europe are twice as stressed as men. About 5 million employed American women experience depression each year. 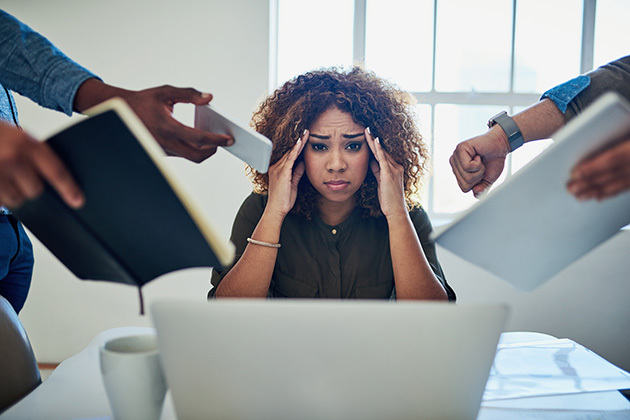 According to a survey by the National Mental Health Association and the American Medical Women’s Association, 83% feel that depression is the top barrier to workplace success. For women who work more than 55 hours a week, however, these stressors increase the risk of depression. According to a recent observational study, those who worked for all or most weekends had 4.5% more depressive symptoms compared to women working only weekdays. For men who worked all or most weekends, 3.4% had more depressive symptoms compared to men working only weekdays. Two-thirds of men worked weekends, compared with half of women. Those who worked all or most weekends were more likely to be in low skilled work and less satisfied with their jobs and their earnings than those who only worked Monday to Friday or some weekends. Researchers analyzed data from the Understanding Society, the UK Household Longitudinal Study (UKHLS), which has been tracking the health and well-being of a representative sample of 40,000 households across the U.K. since 2009. Information about working hours, weekend working, working conditions and psychological distress was collected from 11,215 working men and 12,188 working women between 2010 and 2012. Depressive symptoms such as feeling worthless or incapable were measured using a self-completed general health questionnaire. The study sample enabled researchers to analyze data on women as well as men, reflecting the participation of both genders in the workforce and their different experiences of paid work. The study shows a link between atypical temporal work patterns and depressive symptoms, but there are gender differences in these associations. The poorest mental health is experienced by women working extra-long hours and most/all weekends and by men with poor psychosocial work conditions working weekends. The results also suggest that among women, but not men, working extra-long hours (≥55hours/week) is linked to more depressive symptoms than working standard full-time hours, which corresponds with previous findings of stronger associations between long work hours and depressive disorders for women than men. According to Gill Weston (UCL Institute of Epidemiology and Health Care), lead author of the study, because this was an observational study, exact causes of depression could not be established, but what was clear was that many women face the additional burden of doing a larger share of domestic labor than men, leading to extensive total work hours, added time pressures, and overwhelming responsibilities.